Attending an event at Woburn House? Woburn House is easily accessible by public transport. Woburn House is situated in Bloomsbury, a tranquil area of central London known for its garden squares, such as Tavistock square. Tavistock Square - leafy garden square with a statue of Ghandi as a centre-piece. Tavistock Square was developed in the 1820s by the builder Thomas Cubitt on the estate owned by the Duke of Bedford. The name derives from the courtesy title, Marquess of Tavistock, given to the eldest sons of the Duke of Bedford. It is home to a statue of Mahatma Gandhi, a bust of Bloomsbury author and former resident Virginia Woolf, and a cherry tree planted in memory of the victims of the nuclear bombing of Hiroshima. Bloomsbury offers plenty of choices for accommodation, so to make it easier to choose, we have arranged the hotels in the area according to their ratings on Tripadvisor. The Montague on the Gardens - charming 4* hotel in a Georgian townhouse, 9 mins walk away. Premier Inn St Pancras - said to be one of the nicest Premier Inns, this hotel is only 5 mins walk from Woburn House. Morton Hotel - newly renovated hotel overlooking Russell Square park, 5 mins walk away. Ambassadors - 4* hotel, accross the road. Hilton Euston - 4* hotel, less than 1 minute walk away. See other hotels in the area on the map, or on Tripadvisor. For cheap, longer term stay, student accommodation might be the perfect option for you. There is a considerable number of universities in the area, which rent their halls to the wider public. For more recommendations, please contact us. Organise your next event at Woburn House and let your delegates enjoy this spectacular area of London. Whether you are organising a conference, an exhibition, or a meeting, Woburn House has a range of rooms to suit your needs. We can offer a full range of services, plus air conditioning and free wifi in all our rooms. Our range of rooms can host anything from a meeting for 5 people, to a reception for 260. Contact us for more details. Follow us on Twitter to get more tips for making the most out of the area. Bus stops for all mainline stations are located in Tavistock Square or Euston station forecourt. Euston station serves the whole area of Camden borough, including Tottenham Court Road. When you arrive at Woburn House, please ask at the reception for directions to your event or meeting. Our friendly receptionist will direct you to the correct meeting room or call the person you are meeting. Woburn House is accessible for visitors with restricted mobility, including wheelchair users. Meeting rooms located on upper floors are accessible via wheelchair-accessible lifts. To park, use the Disabled Blue Badge bay on Endsleigh Street cornering Tavistock square. Further disabled parking is located 12 minutes away on Whitfield street. Please contact us for arranging assistance. Whether you need to get a last minute present, a replacement shirt, or some toiletries, The Brunswick centre, a small shopping centre located just a few steps from Russell square station and 6 minutes walk from Woburn House, has everything you need. With a sizable supermarket, large number of high street shops and countless restaurants, it proves to be a good local resource. If you prefer to experience Bloomsbury in a more traditional way, visit its original high street with a variety of small independent coffee shops, cafes, pubs, restaurants and organic shops. Marchmont street is only 4 minutes walk away. Our favourite is 49 cafe, which makes a great spot for breakfast or lunch. If you have more than an hour to spare before or after your event, visit the British Museum. Documenting the story of human history, art and culture from its beginnings to the present, and home to a collection of at least 8 million objects originating from all continents, with roughly 80,000 objects on diplay at any one time, the British Museum is definitely worth a visit. Walk there in less than 10 minutes from Woburn House. 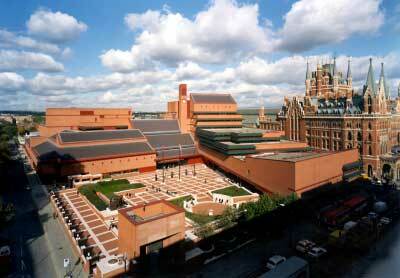 As the largest library in the world and the largest public building constructed in the UK in the 20th century, The British Library stores treasures such as Magna Carta, Leonardo da Vinci's Notebook, or the recording of Nelson Mandela's Rivonia trial speech amongst other 150 million items in most known languages. Get there in just 6 minutes. 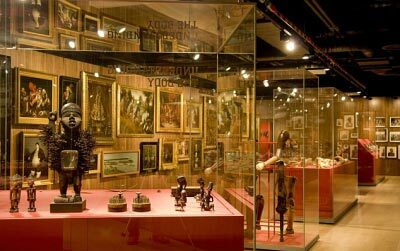 A museum with an unsual mixture of original artworks, medical artifacts and intriqung exhibitions for the 'incurably curious', the Wellcome Collection is free for visitors and includes works by Leonardo Da Vinci or Andry Warhol. Take a stroll past two beautiful garden squares and be there in 6 minutes.